Dentures offer patients a way to get their full, beautiful, and functional smile back. At Mod Squad Dental, we have an expert team who are experienced in restoring smiles with custom-made dentures. If you’re missing some or even all of your teeth, we can provide you with a replacement that will boost your confidence and quality of life. Keep reading to learn more about dentures in San Diego and how you can benefit from them. 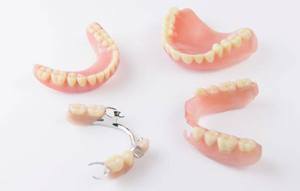 Dentures have been used for hundreds of years and have been made from many materials. Thankfully, modern dentistry allows us to make our patients personalized dentures out of a comfortable and flexible composite resin. Your false teeth are attached to this gum colored base, which rests on your gums or is held in place with clasps. They come in partial or full dentures, depending on how many teeth you’re missing. At Mod Squad Dental, Dr. Greg Friedman and Dr. Shawna Fariba offer 3 different types of dentures to provide you with the restoration that best fits your smile. 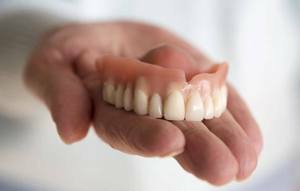 Partial dentures are great for patients who are missing multiple teeth in the same arch of their smile. This replacement allows you to keep your remaining healthy teeth, while replacing the gaps in your grin. We will typically build partial dentures around your remaining teeth, holding them in place with clasps around them for a secure and complete smile. Full dentures are the quickest way to restore your smile to its full beauty if you’re missing most or all of your teeth. They rest on your gums using suction to keep them in place, and you can also use denture adhesive to make sure they stay secure. However, they should still be cleaned each night. If you’re looking for the most stable prosthesis, implant-retained dentures are for you. 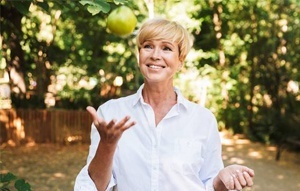 Using dental implants to anchor your denture in place, this option allows for the strongest biting power and it also preserves the health of your jawbone. One of the main advantages that dentures have is their ability to replace some or all of your missing teeth. Their versatility allows us to custom-make your denture based on your smile. This completed grin will give you more confidence, higher self-esteem, and the ability to flash your pearly whites for any photo opportunities. Additionally, dentures are the only replacement that are completely removeable. This allows for easy cleaning and maintenance. They also help fill out your facial appearance, giving you a fuller, more youthful look. The cost of your dentures will vary based on many factors. Primarily, whether you need a partial, full, or implant-retained denture. Our dentists will give your mouth an in-depth examination to check your oral health and the number and position of your lost teeth. They will then be able to provide a fair estimate and recommendation for your dentures. Contact our office today to get started on your custom-made dentures.